We don’t have one complaint! Our stay at Adonis was brilliant, we don’t have one complaint! Rooms basic but very clean and pool area very clean and quiet so plenty of sunbeds available. The bar sold great food and drink and Ben the barman/manager was fantastic!! Always there for you and willing to serve you at the bar at any time! The village is only 5 mins walk and has great restaurants and lovely scenery. Bars and nightclubs only 10 min walk at bottom of hill or 7 euros in taxi. Suitable for everyone. We were made to feel so welcome at our stay in Adonis Apartments and can’t wait to go back next year. The room allocated was pitifully small and reeked of damp and mould. The view was of the railings to the pool. There were a multitude of dead mosquito marks on the wall, the sink plug was revolting, the electrics loose by the shower head, mould on the ceiling, broken cupboard hinge, and a door that didn't lock. The noise from the bar was incessant and lasted until almost midnight - when asked to turn down the level of noise by another guest they were advised that 'you are not in the cemetery yet' Obviously had aspirations to be a club 18-30 DJ. Music was appalling 80's rock - no Greek music. I have read the other reviews of these apartments and despair - this is the very bottom end of what you can expect in Crete - this was our 10th visit to the island and we were appalled. The cleaning was sporadic and poor, and once our door was left unlocked after she had left. I would NEVER recommend this place to anyone. We have never had cause to complain in the past - I was on the phone complaining to First Choice from the moment we arrived but they would only upgrade us ( at a cost ) to Malia! Just returned from Crete, we had an absolutely brilliant time at the Adonis Studios. The room was basic as you expect in Greece but were well cleaned and looked after well. The pool area was also clean and very spacious. The atmosphere around the studios was great, there was sport on TV, music, a pool table and drinking until what time you wanted. The studios and location are ideal for people wanting a relaxing holiday away from all the hustle and bustle, but near enough to local amenities and varied night life. apartments basic,as expected in greece.air con like a tractor,which was a must.expensive bar.had to get to pool early to get comfy sunbeds.more staff needed to run place efficiently.all areas in and out needed a good spring clean.apartment location not too bad as it was first one on top of hill.be careful on apartment choice always ask for balcony as some rooms were like dungeons (we were lucky! )we had top floor with balcony.litter on pool area there from day one.we spent most days on stalis beach but spent the first few and last few days round pool.litter and pool area not swept once.not all people like ouselves took their litter with them.would not return to these studios again. We have just come back from a fantastic holiday at the Adonis in Koutouloufari, booked on a late deal. We thought the location was okay as we wanted a chill out holiday. The village of Koutouloufari was beautiful, typical greek. As soon as we arrived we felt very happy. The pool was fantastic and very clean. The lady who cleans was very good and very friendly with us. Asked if I was okay etc. Ben who was fantastic made us very welcome from the start to the end of our holiday. Nothing was a problem to him and he always had a smile. We would definately stay at Adonis again! i just arrived back from holiday yesterday and have spent the whole day trying to find out details for revisiting adonis studios again next year as i had such an enjoyable time. The apartments were just a short walk to the pretty villages where there was a range of resteraunts with beautiful roof gardens which overlooked the island and a downhill walk to a variety of souvenir shops, supermarkets, a car hire shop, a go kart centre and several quiet sandy beaches. The apartments were small and cosy which was a perfect size for the two of us staying there. The rooms had air conditioning for a reasonable sum extra which i would really recommend as it got very hot in the rooms and a small safe also for a little extra but al worth it knowing your valuables are totally secure. The rooms were thoroughly cleaned every other day by the extremely friendly cleaner. The swimming pool was a decent size and at a great temprature. There were plenty of sun beds situated around the pool and the space was never crowded. Not forgetting to mention Ben the fantastic barman/chef/manager/comedian who kept the whole site alive with his lively character. He seemed to be awake from early morning cooking breakfasts to late night/early morning pouring cocktails and still managed to keep a smile on his face and all the residents. Whenever you needed to know anything about places to visit or eat he would roll off a list of venues he thought you would enjoy. He was great with the children on the site and was every aduts best friend. Definately going to visit again next year most of all so i can see cheeky Ben again ! 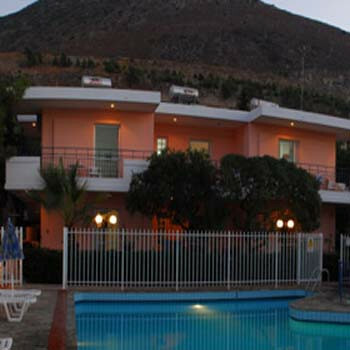 We have just returned from a holiday to Adonis Studios, we booked it 10 days before we left and could not find out much about it. What a great surprise when we got there Ben was there to greet us and help us to our room the apartments are in a quiet,relaxed area of Hersonissos but only 15 minutes away from the nightlife. The room was basic but ok and we didnt intend to spend much time there anyway. Ben our multi tasking host was fantastic he was welcoming,hardworking and full of information if you want to know something he's your man. The pool is lovely and clean and never crowded and because the the resort is small you will make lots of friends and spend many an evening around the bar drinking far too many cocktails, shots you name it Ben has it. We had a fantastic holiday and will return, so Yammas Ben and if your thirsty have a Whisky on us you deserve it.This may not be a 5 star resort but for hospitality and a warm welcome it would get a 10 in our book any day. Ben the hostess with the mostess will do anything that you ask. He cooks, serves at the bar, cleans the pool and is a general handyman. The cleaner however was a bit grumpy but we didnt go on holiday to chat to her! There are some beautiful restaurants up the hill which were recommended to us by Ben. They are a must to visit! Stalis beach is also a must to visit and is only a short taxi ride away, otherwise the pool is perfectly fine to spend your day at. I would definately visit the Adonis Studios again and all 3 of us that went on this holiday would give it 10 out of 10. All round great place and great memories to take home. Adonis Studios is an ideal location if you want to get away and relax and chill, with the added benefit of entertainment nearby if you wish. With it being a small complex the pool was never overcrowded always got a sun lounger result! Tavernas and restaurants all nearby, The Manager Ben is a credit to the Adonis Studios and nothing was too much trouble and kept us in great cocktails and entertained us night after night. We will definately return! Ben how is your Moonpig?.We miss you lots and will see you soon. We have just got back from Adonis Studios. We went on a late deal for a week. Our son is 10 1/2 months old and crawling around. The studios were basic as you would expect in Greece but spacious for the 3 of us to live in, and him to crawl around. Although the cleaner could do with a lesson in her trade as she was quite unpleasant and mopped round things, probably best not to look under the bed, but will say the bathroom was clean. Cooking facilities not great in the room. Bar was good and as well priced as the rest of the resort. The swimming pool was great and plenty of sunbeds.